Why is frequency of service so important to pressure washing walkways? Concrete is porous and will receive oils and resins deeply into those pores. Food, drinks, gum, motor oil, and rust all seep into the point where surface cleaning cannot fully remove the embedded stains. Acid applications are able to etch the concrete, like shaving off a very thin layer, to get down below the absorbed oils and resins. But this can only be done to a limited degree. Oils are a somewhat obvious problem. However, gum is often overlooked as a potential problem. Even after old gum is removed, there remains a discoloration spot on the concrete. The more gum that accumulates, the more the once lovely concrete is sadly and permanently blemished. The best way to fight permanent stains, and maintain beautiful concrete is to pressure wash frequently, removing gum resins and other oils before they seep too deeply into the concrete pores. How often should I have my walkways pressure washed? This depends on the foot traffic that your property receives. In most cases, walkways should be pressure washed at least once every three months. Food establishments and heavy traffic sections should be cleaned anywhere from once per week to once per month. What is the difference between cold water and hot water pressure washing? While cold water pressure washing is able to effectively wash off dirt, it is ineffective for the removal of gum and oils. Hot water washing quickly breaks down oils and gum, and it also increases the effectiveness of degreasers. Why are parking lot lines sometimes not perfectly straight? Parking lot painting machines roll on wheels which are affected by holes and undulations in the parking lot surface. How many inches of snow should my snow removal contracts stipulate? Commercial industry standards typically stipulate 2 inches for plowing, and 1 inch of snow for shoveling walkways. However, we always advise keeping safety and liability matters in mind. Injuries that occur from slip and fall tend to be litigated for damages regardless of how much snow has fallen. Another thing to keep in mind is that snow accumulations will be greater on the north side of buildings. So, while one section may only be wet, another section may have icy conditions or snow accumulations. Again, we advise to consider safety and liability. Why do my windows still have white spots? Blow-back from your lawn sprinklers will deposit calcium and lime onto your glass. Over time, this becomes extremely damaging. Those minerals etch into the glass. Even if removed later, the glass may be permanently pitted at a microscopic level. There are remedial options, however, they are labor intensive. If your sprinklers tend to spray your windows, fix that problem as soon as possible. Then, call us and we will help you to remove the spots. How can I keep my service costs down? Regular maintenance is the best way to keep your costs down. The longer that you wait to perform services, the worse the conditions, and the greater the costs. Parking lot lines that become too worn out will not only require extra paint but may also require new layout charges. Windows cleaned once per year take significantly longer to clean than those that are cleaned quarterly or more often. Pressure washing is especially affected by the frequency of cleaning. Will a personnel lift damage my landscape? Our Scanlift personnel lift weighs 6500 pounds. By using plywood boards, we are able to protect landscaping. The Scanlift is light enough to be safely supported by most parking lots and walkways. By contrast, some snorkel style lifts weigh as much as 30,000 pounds. Always be sure to know how much weight will be used on your property and what limits should be imposed. How can I prevent awning decay? Canvas fabrics hold dirt, which has an abrasive effect. Vinyl and acrylic fabrics, while less porous, are vulnerable to sun rot. Both should be cleaned at least four times per year, and vinyl/acrylic fabrics should also be sealed just as often. Will pressure washing splatter my windows? Pressure washing of walks will get windows wet within two feet of the sidewalk surface. But not to worry! 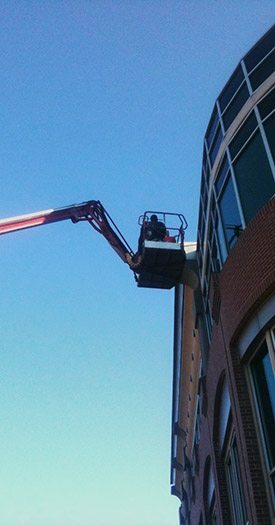 Our pressure washing prices include cleaning those splatters with professional window cleaning equipment. Pressure washing of walls will spray the windows. So, we will always provide an itemized price to professionally clean the windows from top to bottom at such times.